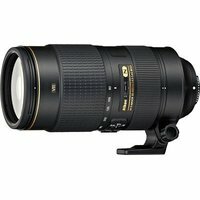 The Nikon 80-400mm AF-S Nikkor f/4.5-5.6G ED VR Lens is a high-performance telephoto zoom lens for use with full-frame FX-format digital SLRs. With a broad 80-400mm focal range and superior optical design, this lens is ideal for a variety of subjects including wildlife, landscapes and sports. Nikon's Vibration Reduction (VR) system minimises camera shake and allows you to shoot at shutter speeds up to four stops slower. The Silent Wave Motor (SWM) ensures fast, quiet and accurate autofocus and the Nano Crystal Coat greatly reduces ghosting and flare even in backlit situations.